Retinol is commonly prescribed for everything from acne to wrinkles, but the side effects can be painful. Do alternative treatments work? I noticed the first sign of aging on my face when I was 26. Between summer and fall of that year, a very faint tea-colored mark appeared on my upper left cheek. It was smaller than a dime, in a shape that I can only describe as “blob-like,” and I swiftly booked an appointment with a dermatologist to rule out anything serious or sinister. It turned out to be a harmless sunspot, but that first sign of the gradual, inevitable effects of time sent me in a panicked tailspin to the nearest Sephora to see if I could pay to combat the signs of aging — or at least hold them off a bit. I’d read about the wonders of retinol — a form of vitamin A lauded as the gold standard of anti-aging ingredients — so I purchased a bottle of serum containing the magical ingredient and headed home. The following week was not to so magical as my sensitive skin reacted strongly to the retinol. Some mild irritation and redness is normal with retinol, and usually goes away within a couple of weeks, but the burning, itching and peeling were too much for me. I swore off retinol, despite its promised results. So last fall, when I started seeing articles touting retinol alternatives, or “retin-alts,” that have the same benefits as retinol without the harsh side effects, my interest was piqued. But before talking about alternatives to retinol, it’s important to understand retinol itself. Retinol belongs to the retinoid family (various synthetic or naturally occurring analogues of vitamin A). “Retinoids, on their basic cellular level have an effect in jump-starting cellular metabolism and increasing collagen synthesis,” says dermatologist Dr. Steven Greene, medical director at Advanced Dermatology & Laser Institute of Seattle and an associate professor in the dermatology division at the University of Washington. Collagen synthesis leads to thicker skin and greater water retention, both of which make skin look more plump and youthful. “Another thing retinoids do is tighten pores, and that decreases over-activity of the sebaceous glands that produce oil and sebum. That’s why they are often used in the treatment of acne.” Dr. Greene also notes that retinol can help reduce hyperpigmentation, and it is capable of turning over UV-damaged skin cells that can increase an individual’s risk of skin cancer. Of course, as I found out that fateful summer, there are side effects. “Retinol users can experience redness, burning and scaling of the skin, which usually peaks around the two-to-four-week mark before subsiding,” says Dr. Anh Tran, a dermatologist at The Polyclinic. For those who can’t push through the pain, or who have severe and lasting reactions, there is still hope in the form of bakuchiol. An ingredient derived from the Psoralea corylifolia, or babchi plant, and historically used in Ayurvedic medicine, bakuchiol has started appearing in over-the-counter skin-care products, touted as a gentle but effective alternative to retinol. A study published in 2014 in the International Journal of Cosmetic Science reports that after a 12-week trial of twice-a-day facial application of a skin-care product containing bakuchiol, subjects noticed a significant improvement in the appearance of fine lines, wrinkles, pigmentation, elasticity and firmness. Beauty bloggers have also praised the reduced side effects of retin-alts — a benefit I definitely noticed when I tried it out. 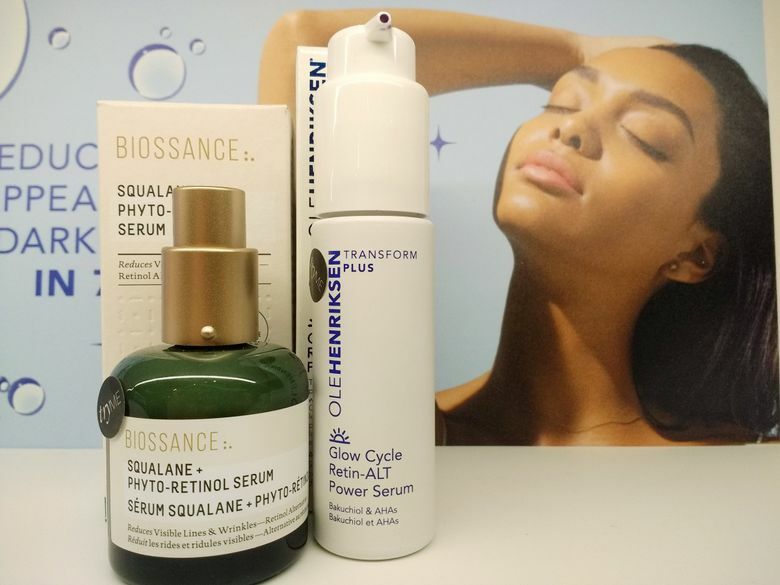 Taking a not-so-scientific approach, I picked three products — Whish Replenishing Day Cream, Ole Henriksen Glow Cycle Retin-ALT Power Serum and Biossance Squalane + Phyto-Retinol Serum — and used them each for four days, with two days in between each product. While that certainly isn’t long enough to see full benefits, I did notice that each treatment was gentle, absorbed quickly and smelled pleasant, to boot. By the end of the two weeks, my skin looked brighter, and though I did experience some slight dryness, there was no redness, flaking, or irritation. I wouldn’t call it an epidermal miracle, but my skin did look slightly better. Rachel Gallaher Rachel Gallaher is a Seattle-based writer and the senior editor of GRAY Magazine.